Witnesses and lawyers huddle as the Legislature's Government Oversight Committee goes into executive session on Thursday in Augusta as they hear testimony concerning the Good Will-Hinckley affair. From left are Aaron Chadbourne, the governor's education adviser, Cynthia Montgomery, the governor's chief attorney, and their attorney Cliff Ruprecht. An unknown person stands behind them. Co-chairs Roger Katz (left), R-Augusta and Chuck Kruger, D-Thomaston, listen as Gov. 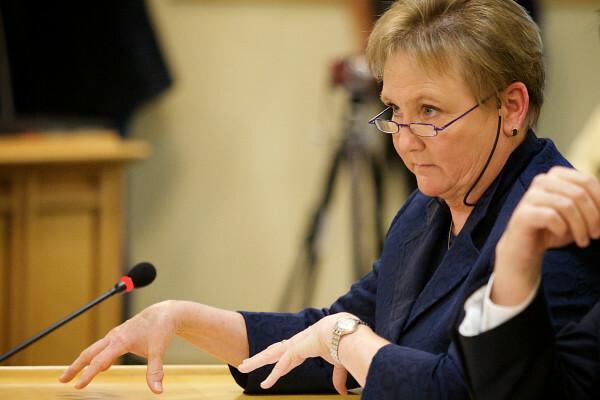 LePage's lawyer, Cynthia Montgomery, invokes attorney-client privilege while testifying before the Legislature's Government Oversight Committee on Thursday in Augusta concerning the Good Will-Hinckley affair. 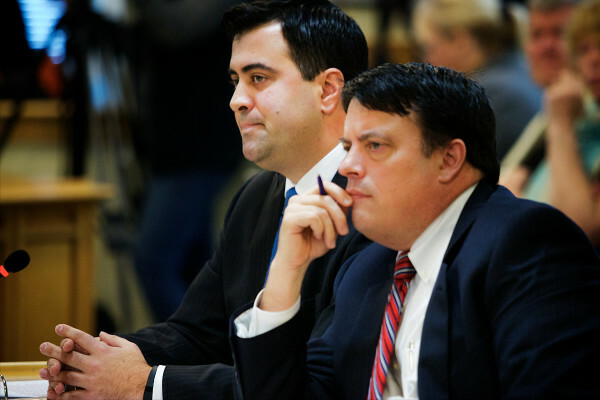 Aaron Chadbourne (left), the governor's education adviser, accompanied by attorney Cliff Ruprecht, testifies before the Legislature's Government Oversight Committee on Thursday in Augusta concerning the Good Will-Hinckley affair. Rep. Anne-Marie Mastraccio, D-Sanford, questions Aaron Chadbourne, the governor's education adviser, during testimony before the Legislature's Government Oversight Committee on Thursday in Augusta concerning the Good Will-Hinckley affair. Cynthia Montgomery, the governor's chief attorney, testifies before the Legislature's Government Oversight Committee on Thursday in Augusta concerning the Good Will-Hinckley affair. 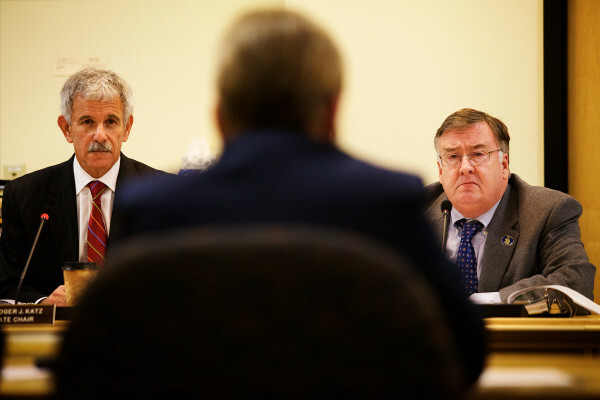 Co-chairs Roger Katz (left), R-Augusta and Chuck Kruger, D-Thomaston, listen to testimony before the Legislature's Government Oversight Committee on Thursday in Augusta concerning the Good Will-Hinckley affair. Tom Desjardin, former acting education commissioner, testifies before the Legislature's Government Oversight Committee on Thursday in Augusta concerning the Good Will-Hinckley affair. AUGUSTA, Maine — A marathon day of testimony around the question of who told whom what and when regarding Republican Gov. Paul LePage’s successful effort to force House Speaker Mark Eves out of a job at Good Will-Hinckley ended late Thursday afternoon without a clear answer. Thursday’s investigative hearing by the Legislature’s Government Oversight Committee was widely anticipated to be the chance for lawmakers to question senior officials in the LePage administration directly about how the Republican governor’s threat to withhold more than $1 million in funding for Good Will-Hinckley over two years was communicated to the organization. Much of the testimony centered on whether LePage’s statements that he could no longer “support” Good Will-Hinckley if it hired Eves represented a direct threat to cut off state funding over which the governor had control, a move that could have jeopardized grant money from the Harold Alfond Foundation by placing the organization’s overall financial viability in question. Good Will-Hinckley is an organization in Fairfield that, among other things, runs the Maine Academy of Natural Sciences, a public charter school. In June, following a national search, the organization hired Eves, a Democrat, as its president but then rescinded that offer after LePage stepped in. LePage has publicly admitted that he told Good Will-Hinckley officials that he would withhold the funding if Eves took over as the organization’s leader, but it has been unclear how that threat was communicated. 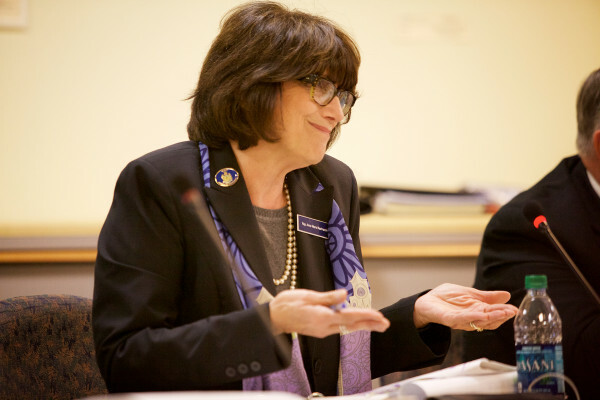 LePage’s chief legal counsel, Cynthia Montgomery, and one of his senior advisers, Aaron Chadbourne, answered questions for the first time during the investigation, which dates back to July when the Government Oversight Committee unanimously assigned the nonpartisan Office of Program Evaluation and Government Oversight to explore the ethics and legality of LePage’s actions related to Good Will-Hinckley’s decision to rescind its offer to Eves. Montgomery testified that she knows nothing about events that occurred before this past July, when Eves sued LePage in a federal lawsuit. Chadbourne said he communicated with various Good Will-Hinckley officials, including Sara Vanderwood, who at the time was a lobbyist for the organization, but never said explicitly that LePage’s ire would result in the withdrawal of state funding used to house students at Good Will-Hinckley. Vanderwood and Jack Moore, chairman of Good Will-Hinckley’s board of directors, had previously told investigators that the funding threat as they understood it came through Chadbourne. Rep. Anne-Marie Mastraccio, D-Sanford, a member of the committee, challenged Chadbourne on several fronts. “It is not something I ever spoke to him about or said any words about,” Chadbourne said. 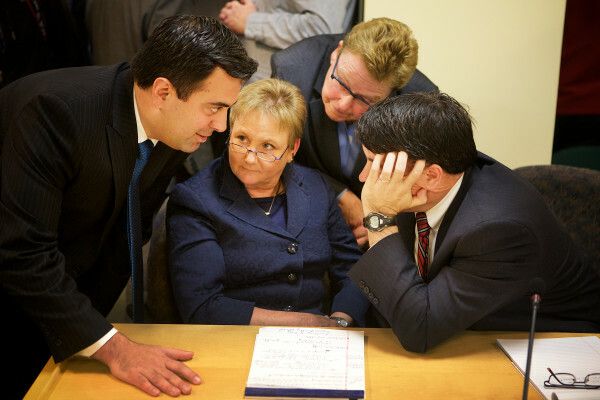 Later in the day, Vanderwood told the committee that Chadbourne told her in a one-on-one meeting that Hinckley hiring Eves would result in the organization “losing LePage’s support,” which she took to mean the state funding from a discretionary account over which the governor has control. Vanderwood said Thursday that while she interpreted Chadbourne’s statements to her to be about the funding, he did not say that explicitly. 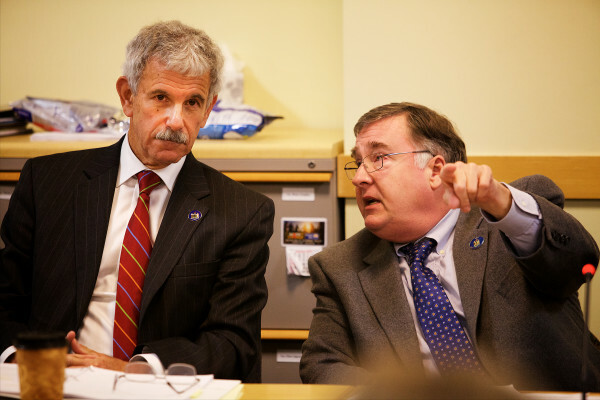 Republicans and Democrats on the committee ended up in a quarrel later in the day during questioning of Bill Brown, who works for Eves in the Legislature and who at the time of Eves’ hiring was also chairman of the Maine Academy of Natural Sciences board. Brown testified that he notified Eves of the job opening, suggested he apply and helped Eves organize his resume, but then recused himself from votes regarding Eves’ hiring. 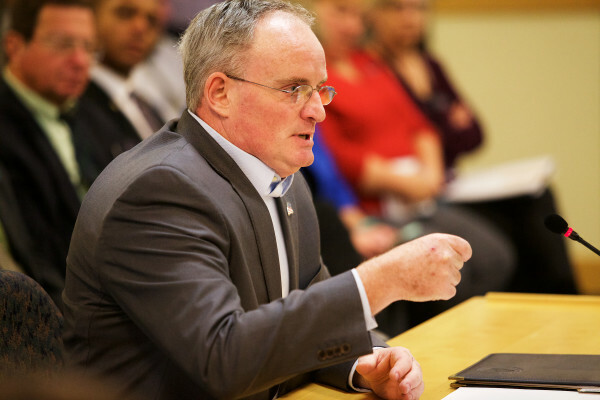 Republicans on the committee started to focus on Eves’ qualifications and whether Brown unfairly advocated for him, which caused Democrats to argue that the questioning was veering outside the scope of the investigation — which from the beginning has been about the funding and LePage’s role in forcing Eves’ firing. Republicans pointed to Democrats’ questions earlier during the hearing directed to Richard Abramson, former interim president of Good Will-Hinckley, about how the board had selected Eves after a nationwide search as precedent for grilling Brown on Eves’ qualifications. LePage has publicly criticized Eves as unqualified for the job. Roger Katz, R-Augusta, the Senate chairman of the committee — who LePage had asked to step aside because of past conflicts with the governor — sided with the Democrats on this matter, but Rep. Deborah Sanderson, R-Chelsea, moved to overrule Katz’s ruling. That motion failed in a 6-5 party-line vote. Katz did not vote. That conflict highlighted the partisan acrimony that roiled just beneath the surface of the hearing, which stretched more than seven hours. LePage has maintained that his office did nothing illegal or unethical and that the Government Oversight Committee’s probe amounts to a “witch hunt” by the governor’s political rivals. The Government Oversight Committee’s task is fact-finding, and the committee will reconvene on Dec. 3 to review the testimony it has received. If there is to be any action taken by lawmakers against LePage, it would have to originate in the Legislature.